Why is it that an idea for a blog post always strikes me when I have no access to a laptop or paper. Like when I am driving or travelling. I half form the blog post in my mind; witty catchy sentences and phrases swirl around in my head and I am dying to jot them down. But Once I am in front of my laptop – nothing ! My mind goes blank and I am really at a loss on how to put down my thoughts. The words don’t come and the sentences that sounded witty and brilliant in my head look drab and boring on my computer screen. Now what kind of Writer's Block is that ! Ever happened to any of you? its always happened to me..:)..nice cartoon too..
@ chitz - dont u hate it when that happens ! yes it happens, its the bloggers syndrome :)Blogosphere sometimes becomes Blogopressure :) I remember writing about it sometime. @Sri- Thanks and welcome to my blog ! 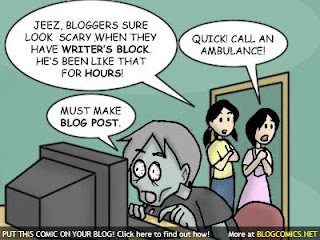 Have seen this happen to many of my blogger friends :). I took a month break when I was not able to come up with something good. Scary position to be in, I agree :).